For most people in the world today, water is not drinkable unless treated with chemicals. 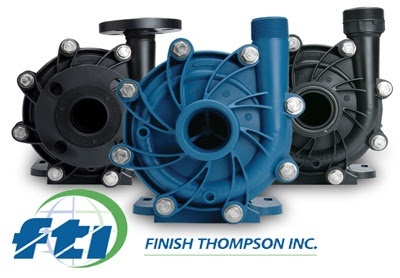 Finish Thompson Pumps are used every day worldwide to pump water treatment chemicals. What are these chemicals and what do they do? Coagulants and flocculants - Help remove small, suspended particles by making them clump together forming larger particles that are easier to filter out. Aluminum sulfate, ferric chloride and polyaluminum chloride (PAC) are commonly used. Neutralizing agents - Added to control the pH if required. Proper pH is important because it allows other chemicals to work more efficiently and helps control corrosion in the distribution system and customers plumbing. These include sodium hydroxide, sulfuric acid and hydrochloric acid. Disinfectants - Kill pathogens (including bacteria and viruses) that may be in the water. Most drinking water systems are required to maintain a residual level of disinfectant in the distribution system to protect against new pathogen formation. Sodium hypochlorite (bleach) is one example of a commonly used disinfectant. Corrosion inhibitors - Form a protective coating inside pipes in the distribution system and in customers’ homes to prevent lead from leaching into the drinking water, especially important in older communities. Orthophosphate is a common inhibitor used in drinking water supplies. Flint Michigan’s water crisis was due to omitting orthophosphate in the treatment process. Fluoride - Routinely added to drinking water (with the support of numerous dental associations) to improve the dental health of consumers. The fluoride provides three-way protection against the formation of cavities. The tooth mineral that is created during remineralization is harder than the original. Fluoride inhibits bacteria’s ability to create acids. The most common material used to fluoridate is a material called hydrofluosilicic acid.